Epson BT-300 smart glasses can be used to view Dino-Lite microscopes live magnified video output. 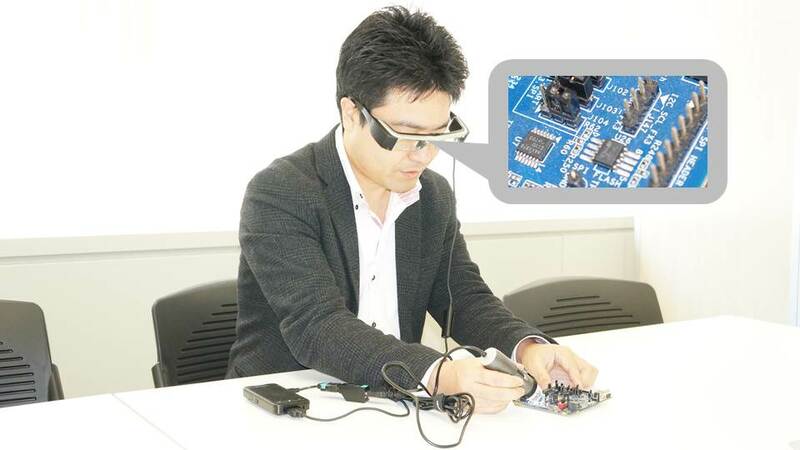 A closer look at the Epson BT-300 head-mounted display which is compatible with Dino-Lite microscopes. The Epson BT-300 shown being used with a Dino-Lite. A sample of what the wearer of the Epson BT-300 sees with a Dino-Lite digital microscope. Recent developments in head-mounted displays has provided the opportunity to pair the Dino-Lite with a wearable device. The Epson BT-300 can be used with compatible Dino-Lite microscope cameras. This combination allows for high quality Dino-Lite imaging and portability with the advanced future of viewing options with OHMD.